Welcome To Ajetun's Blog: Fayose cautions Buhari over probe of military chiefs, says "$2.1bn arms deal is a scam"
Fayose cautions Buhari over probe of military chiefs, says "$2.1bn arms deal is a scam"
Ekiti State Governor, Mr Ayodele Fayose has advised President Mohammadu Buhari on his order for 18 Military Generals to be probed by the Economic and Financial Crimes Commission (EFCC) over alleged involvement in the $2.1 billion arms deal. Governor Fayose, who reacted to the president order for the 18 serving and retired military chiefs to appear before the EFCC from Monday, through his Special Assistant on Public Communications and New Media, Lere Olayinka, said the military officers ought to have been probed in accordance with the armed forces rules of engagement. The governor, who reiterated his support for the fight against corruption, said "the $2.1 billion arms deal is a scam because all that they are just doing is to brandish figures to deceive Nigerians and demonized the Peoples Democratic Party (PDP) and those opposed to his dictatorship in the All Progressive Congress (APC). Till today, the amount they have charged people for stealing is not up to N10 billion and $2.1 billion they claimed was stolen is about N600 billion. "The president must let Nigerians see where the arms deal is in the 2015 Budget and publish details of the imaginary $2.1 billion scam. Also, the President must tell Nigerians how his friend, Jafaru Isa was able to return N100 million to the EFCC within three days because there are insinuations that the N100 million refunded came from the Presidency." He said it was strange for serving military generals to be interrogated by junior police officers, adding that; "The president should not act in a way that he will be perceived as ridiculing the armed forces." He said; "Even though I am not a military officer, but I know that there is what us called orderly room trial or court martial, which military men who erred in the performance of their duties are made to go through. It is until they are found guilty and probably dismissed that they are made to face court trial. "In this case, how does it feel for a serving Military General to be interrogated by an Assistant Commissioner of Police (ACP)? "I think we should not destroy our democratic institutions, especially the judiciary and the armed forces because we are fighting corruption. "Already, the President has ridiculed the judiciary by disobeying the courts and coming on television to say that orders oyf the court do not hold waters. He is also destroying the Independent National Electoral Commission (INEC) by turning it to commission for inconclusive elections. 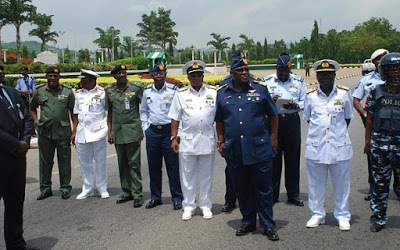 He should not ridicule the military, and men of goodwill should advise the President to thread cautiously. "Also, the international community, especially the United States, United Kingdom and the United Nations should caution the President against actions capable of bringing down institutions of government under the guise of fighting corruption."